You can see all of the applications that have been published in your portal here. All applications that have been edited recently will be listed here. 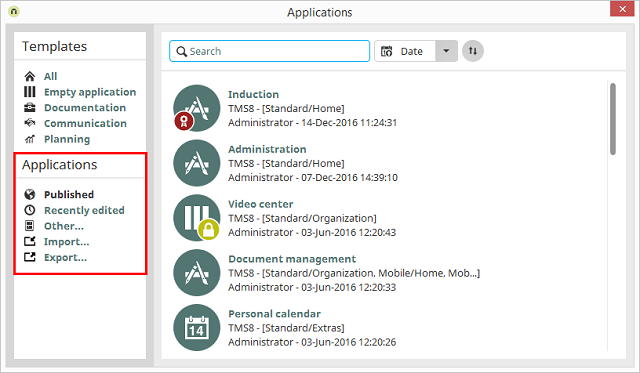 Opens a dialog where you can search through the application directory and select the "application.guid" file to open the application. 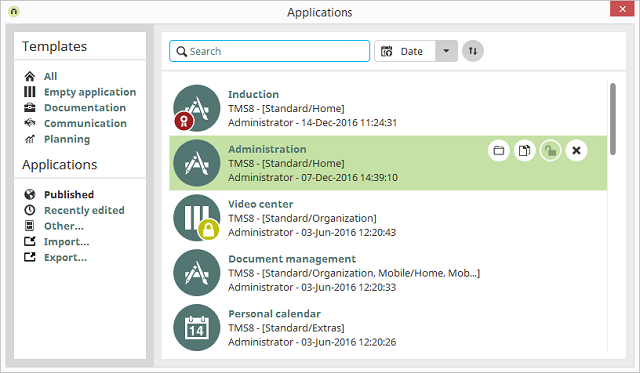 The application directory can be found portal directory internal/application/store/<Application GUID>. Applications can be imported and exported using the links here. 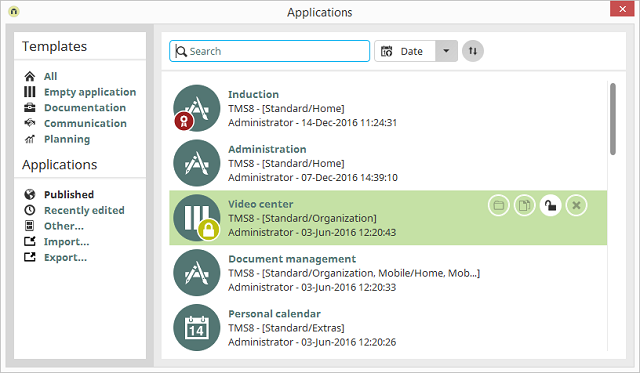 If you have a large list of applications, the search box in the upper area of the Application Manager makes it easier to find a specific application. Simply enter the title or the GUID of the application to be found. Furthermore, you can sort the list by date, title or user in ascending or descending order on the right of the search box. In a newly created portal, the so-called system applications, like the "Users" application, have already been published in your portal. An application that is currently being edited will always be designated with this symbol. If you move the mouse over an application, symbols will be displayed to the right of it. Please note that changes applied simultaneously to an application by two editors may be lost. Opens an unlocked application to be edited. Opens a copy of the application to be edited. The data in the original application is not transferred. Information about the templates at the top-left of the dialog, which you can use to create your own applications, can be found here.